This little girl is such a daylight! 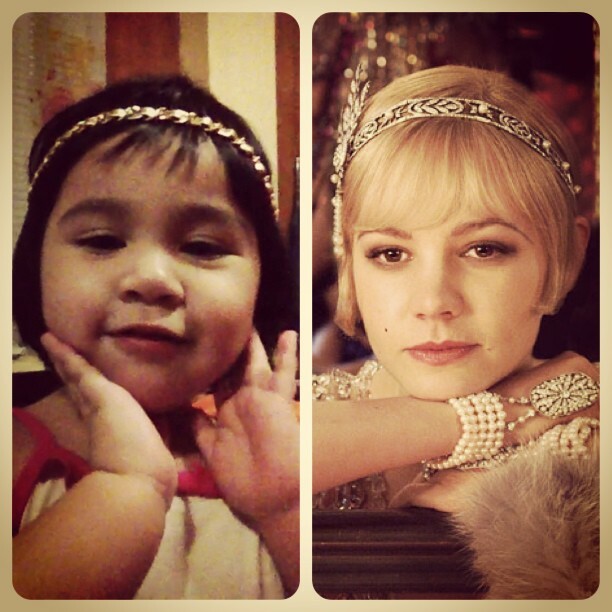 She imitated Daisy's pose in the movie Gatsby. Not really a great feat but for a toddler of two, this antic certainly elicit smiles.Come to think, the movie Gatsby is the second film adaptation of F. Scott Fitzgerald 1925 novel The Great Gatsby. The first film adaptation was in 1974 with no less than Robert Redford playing the part of Jay Gatsby and Mia Farrow as Daisy Buchanan. Almost 30 years later, Leonardo di Caprio is Gatsby and Carey Mulligan as Daisy. I don't remember if the original Gatsby was successful but I do remember Robert Redford's great looks back then. I don't feel like watching the current Gatsby film. I'd rather watch Tobey McGuire as Spiderman!